How should UNC (Universal Naming Convention) be pronounced? In a sentence, should it be "a UNC share" or "an UNC share"? 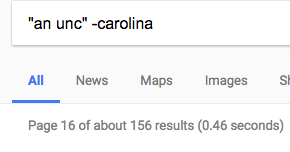 A Google search for "a unc" -carolina results in about 400,000 results while "an unc" -carolina results in about 100,000 results. So group consensus was always the only standard for this abbreviation. Regarding the Google search you quoted in your question: I don't believe the results can be trusted, because formally there is no such thing as "a UNC" or "an UNC". There is the naming convention ("the UNC"), and then there is a path name that follows the convention. The latter are usually called "UNC paths", "UNC names", etc., not just "UNCs" (although it's possible that some people might call them "UNCs" conversationally, as a personal shorthand). Doing a Google ngram search for "a UNC path" vs "an UNC path" shows "a UNC path" starting to rise in use around 1992 and plateauing in a few years, as you would expect considering the use of the technology associated with the term. On the other hand, there are no recorded examples of "an UNC path" whatsoever. Not the answer you're looking for? Browse other questions tagged pronunciation abbreviations acronyms or ask your own question. What is the correct pronunciation of “AJAX”? Is it right to call it “SEO” and how do you pronounce it? How should “pinisi” be pronounced?